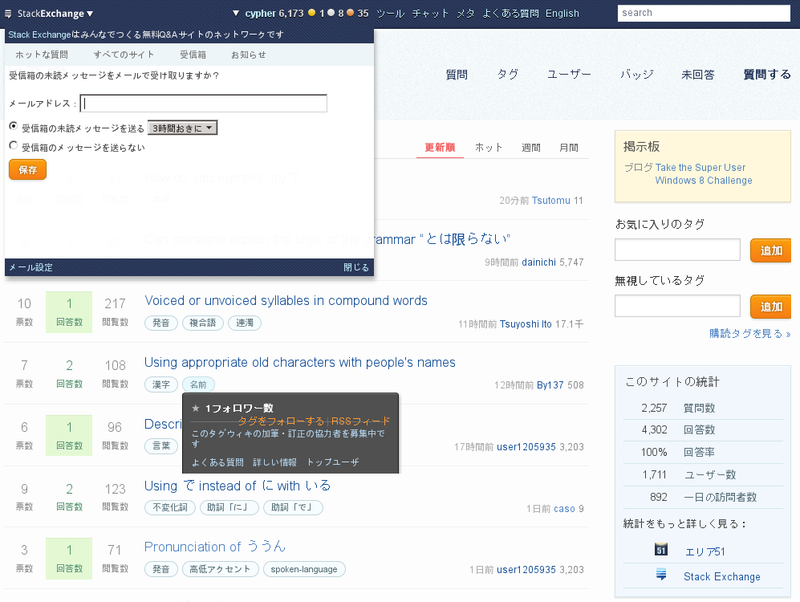 This script was originally created for the JLU (Japanese Language and Usage) site as part of the Creating as much Japanese interface as possible to be more inclusive of native Japanese speakers meta page, but it now should work on all the major Stack Exchange sites. To change to Japanese, click the 日本語版 icon which will appear in the top right corner of every page. It's a work in progress, but a fairly large amount of the site has been translated including UI elements, tooltips, dates, some messages, Stack Exchange badges+descriptions, tags on the JLU site etc. For the current status, please see the GitHub project page. Creative Commons CC0 1.0 (Public Domain Dedication), so that the translations may be reused if an official Stack Exchange localization gets done etc. The platforms I'm currently testing it on are Firefox 16.0.1 with Greasemonkey and Chromium "20.0.1132.47 Ubuntu 12.04 (144678)". I hope to support IE, Safari and Opera one of these days too. Please leave a comment or post an answer here and I'll try to respond as quickly as possible. The source code can be viewed at https://github.com/cyphr/Stack-Exchange-Japanese-Localization. Browse other questions tagged script localisation japanese .